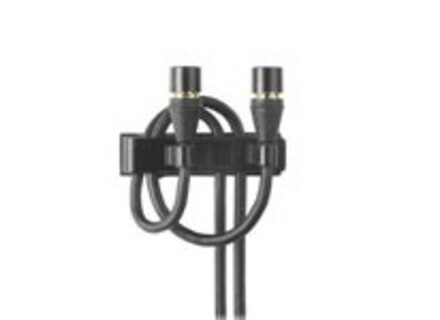 MX150, Headset & Lavalier Microphone from Shure in the Microflex series. Shure has added new models to its Microflex line, the MX150 subminiature lavalier microphone and the MX153 subminiature earset microphone. With CommShield technology designed to resist noise from smartphones and other wireless devices, Microflex microphones are suited for use in meeting facilities, houses of worship, and other sound reinforcement applications. The MX150 subminiature lavalier microphone is available with either an omnidirectional or cardioid polar pattern, and in wired or wireless configurations. A new snap-fit foam windscreen is included, which locks to the microphone and reduces plosives and wind noise. A new multi-position tie-clip is designed to reduce cable noise by routing the cable in loops, and can be mounted horizontally or vertically on different types of clothing. The same clip can accommodate single or dual microphones for applications where redundancy is required. 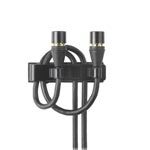 The MX153 subminiature earset microphone is suited for speech reinforcement in situations where a lavalier mic does not provide sufficient gain-before-feedback. The MX153 features a padded earloop, and a boom for microphone placement. The MX153 is available in black, tan, or cocoa to match typical skin tones. The MX150 lavalier and MX153 earset are available now in a variety of configurations. [NAMM] Shure ULX-D Wireless System Shure introduces the ULX-D Digital Wireless system for use in corporate, education, worship, and live performance facilities. [NAMM] Samson Auro D208 & D210 Samson’s Auro D208 and D210 2-way active loudspeakers feature 200 watts. [NAMM] Shure Axient Wireless Management Network Shure is now shipping the Axient Wireless Management Network, which can automatically change frequencies to avoid interference.